Imagine coming home to a house that sparkles and having the free time to enjoy it. With Messy Maid housework is one item you can cross off your "to-do" list. And you will be able to take comfort in knowing that someone you trust cleaned it professionally and to your satisfaction - every time. Treat yourself one special day each week. The professional teams at MESSY MAID can provide you with the occasional or one time clean. However, the majority of our clients choose either weekly or biweekly service. Everybody's needs are different. Please call us to discuss your individual requirements. The company you can trust. In order to join the MESSY MAID team, potential applicants are screened extensively. We run a complete Criminal and Background check to ensure that the individuals entering your home are trustworthy. MESSY MAID employees go through a two-week training period before they are ever permitted to enter any home. Even after the initial training, the quality of their work is supervised by our management staff. A checklist is also provided for our teams to ensure everything has been cleaned to standard. 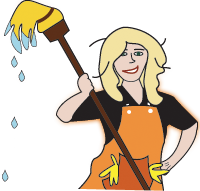 As per our guarantee, if you are not completely satisfied we will have one of our teams available to re-clean your home. Your protection is first in our books. All MESSY MAID employees are fully bonded and insured which includes liability and worker's compensation. Our staff uses the utmost care in your home however, occasionally accidents do happen where something may break. Rest assured that we have the protection to replace or fix an item should that happen. Let MESSY MAID Make Your Day!